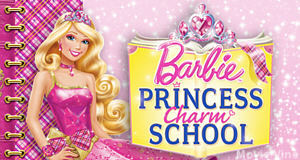 The Barbie in Princess Charm School movie is for people who have a daughter or who know a little girl who loves Barbie. This is the twentieth computer animated film that was released on September 13, 2011. My daughter loves Barbie and she has been watching this movie non-stop, which made me to decide to do a review on it. I will give you some highlights from the movie. Blair Willows (Barbie) wins a lottery contest to go to The Princess Charm School where she makes two new friends Hadley and Isla. She learns all of the proper manners on how to become a princess, but she finds out that the training is hard work. Blair has competition with a girl named Delancy who is the daughter of the teacher (Dame Deven). Blair, Hadley, and Isla discover a secret from a painting that Blair is adopted and she’s a real life Princess. Dame Deven is so mean to Blair because she knows the story about her family. Dame Deven is pushing her daughter to get the Gardania’s magic crown before Blair does. At the end, Blair gets her title crown and becomes friends with Delancy. I think this movie is cute and charming. Comments for Barbie in Princess Charm School Movie Review are now closed.